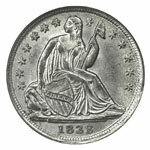 The silver half dime was the third coin to appear in circulation bearing Christian Gobrecht's seated figure of Liberty. 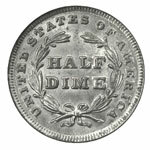 It followed the rare silver dollars dated 1836 by a few months and the 1837 dimes by just a few weeks, the first such half dimes being coined July 25, 1837. Undoubtedly this design would have remained in place through 1891 had the half dime denomination itself not been terminated by the Mint Act of 1873. Several distinct subtypes exist for this series. All pieces dated 1837 were coined at the Philadelphia Mint and bore no stars. 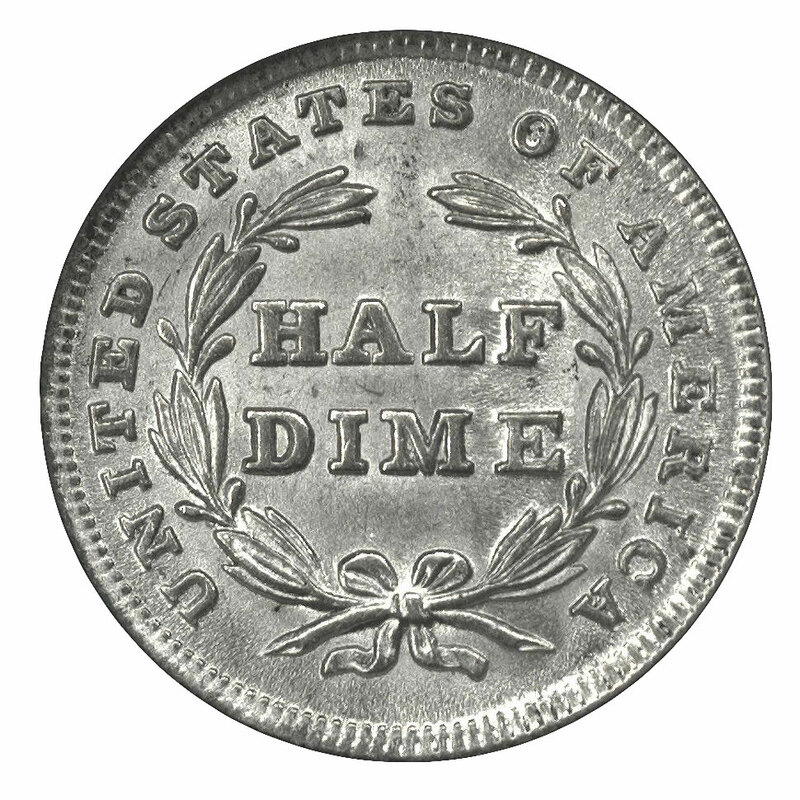 The half dimes coined during 1838 at the New Orleans Mint were similarly starless. 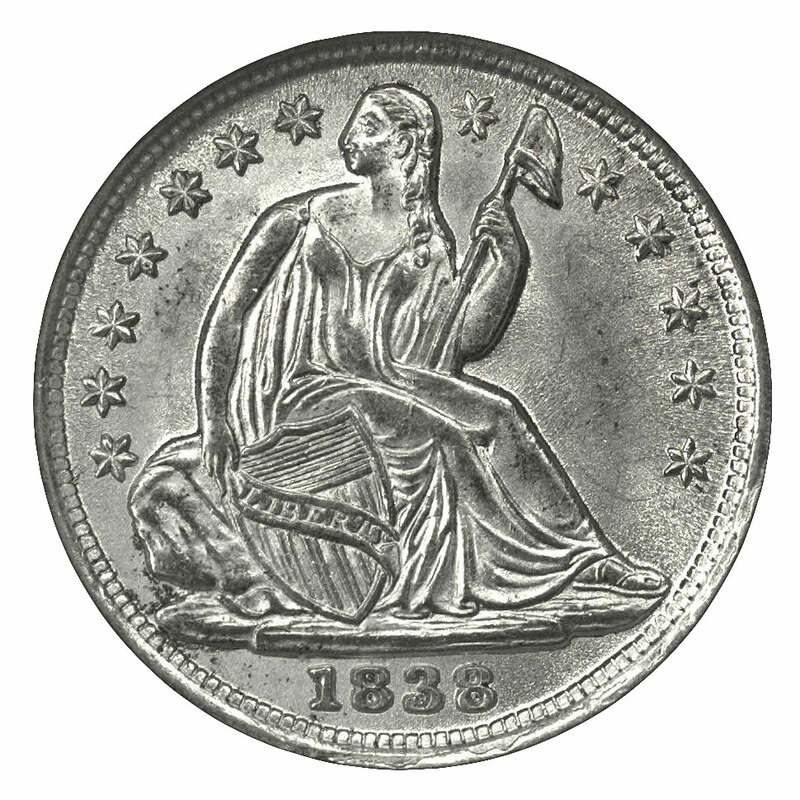 The Philadelphia coins dated 1838 did display a semi-circle of stars around their obverse, and this ornament remained in place through 1859 on all Seated Liberty half dimes. Robert B. Hughes modified Gobrecht's original Liberty figure midway through 1840, and Anthony C. Paquet furnished his own interpretation in 1859. Paquet's Seated Liberty was used solely for the Philadelphia Mint half dimes of that date. The Hughes figure was restored in 1860, but the elaborate cereal wreath reverse replaced the plainer olive or laurel wreath at the same time, and the legend UNITED STATES OF AMERICA was relocated to the obverse. Throughout its years of production the Seated Liberty half dime was subject to localized weakness of strike. This is most commonly seen at the bottom of Liberty's shield and the adjacent base, at her head and at her foot. On the reverse, the upper portion of the wreath (opposite these problem spots) was subject to weakness. On many half dimes, particularly on those from the latter half of the 1850s, the denticles are not fully formed. In general, the half dimes having the legend UNITED STATES OF AMERICA on their obverse (1860-73) are more subject to being weakly struck, the upper left of the wreath rarely being complete. Even some proofs are found with this area incomplete. Because half dimes are lightweight they were more likely than larger coins to be mis-fed into the coin press, leading to clashed dies. The resulting clash marks have no bearing on a coin's grade, but these lines can distract from the coin's aesthetic value, and unknowledgeable persons may mistake them for damage to the coin itself. Also common, particularly on the early dates, are die cracks. Again, these do not affect a coin's grade. Since half dimes are small and light, they did not suffer heavy contact marks and abrasions to the extent that larger coins did. Instead, most non-mint made flaws seen on uncirculated Seated Liberty half dimes are the result of careless handling or improper cleaning. Coins that have been spared such numismatic abuse typically are quite appealing. Mint state Seated Liberty half dimes seem to have survived in greater numbers than other coins of this type, perhaps because their low face value made them more attractive to collectors of the time. The selection of mint state coins is large enough to satisfy the many persons collecting half dimes by type alone. The ideal example is a coin struck from unworn dies (known as "early die state"). It also should have unimpaired luster, meaning that it has not been cleaned or, at least, not harshly cleaned. Choosing between a richly toned coin and one that is untoned, or "white," is a personal decision. Toning normally doesn't affect a coin's grade unless it is exceptionally beautiful (in which case it can raise the grade) or just plain ugly (which can lower the grade). Many of the same criteria apply when selecting a circulated half dime, especially for pieces in the higher grades of Extremely Fine and About Uncirculated. In lower grades, factors such as die state and striking quality are less important, though collectors still favor a natural appearance in their coins. Half dimes that have been harshly cleaned will not be certified by the major grading services, and they can be a tough sell when it comes time to liquidate one's collection.